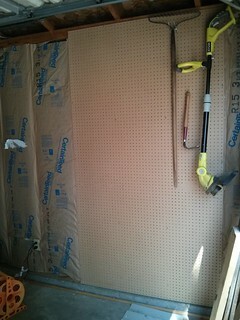 Now that I've got some insulation up (note that the composition doesn't show exactly how much more insulation I have up), I thought I'd try to hang one piece of pegboard to see if I could do it myself. Answer: yes, and it's even level (either that or my level ain't level). However, my plan to 'go for two' hit a snag when I realized that I'd have to cut a hole around that outlet. Probably not a big deal for two people, or one guy who knows what he's doing, but remember that we're talking about me here. This page contains a single entry by Chris published on August 3, 2014 9:02 PM. Project Workshop... Commence! was the previous entry in this blog. The Internet Is Changing Something Something, Um, TL;DR is the next entry in this blog.